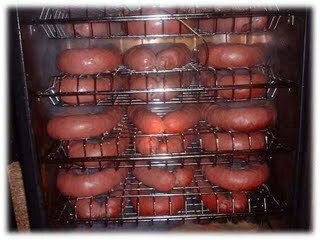 Smoking venison sausage is easy and brings out an enhanced flavor in the venison deer during the long smoking process. If you like your sausage with a crisp crust, we recommend saving yourself some time and grilling the sausage. However, we feel that using a smoking recipe will give it an extra flavor profile that is more enjoyable. Another tip we recommend is to start up your crock pot with your favorite spicy barbecue (BBQ) sauce, cut up your venison sausage into little quarter-sized slices and let it simmer for a couple hours. This makes for a tasty morsel that you can serve as an appetizer with toothpicks. You can make a believer out of anyone who claims they don't like venison deer sausage with this simple recipe. This recipe starts by lighting up your smoker and soaking your wood chips in water before you can put your venison sausage on the smoker. If you have a charcoal smoker, you should light it about 30 to 35 minutes before you are ready to start cooking your venison sausage. Put your venison sausage on your smoker. If you are using a smoker with a water pan, heat up a beer to a boil on the stove top and fill your water pan to boil and add moisture and flavor during the smoking process. Make sure you open the vent on your grill or smoker to to about 3/4 the way open. If your vent is adjustable, place it right above the venison sausage so the smoke is drawn over the sausage before it goes out the top. Your venison sausage will take about 2 hours to smoke depending on the size and temperature of your smoker. Make sure you don't over check your sausage during the smoking process or you will let the smoke and heat escape which will impact the flavor and smoking time. See below for more information about smoker cooking times and how to determine when your venison sausages are done. The smoking time for venison sausage is only about 2 to 2 1/2 hours. This is just enough time to get a nice smoky flavor to penetrate the venison sausage. Use a meat thermometer and check after an hour for an internal temperature of 145-155 degrees Fahrenheit. It is optional, but you may choose to put your venison in the crock pot which will add an hour or two to the cooking time. We recommend this because it is easy to serve in a small crock pot with toothpicks similar to how little smoky sausages are served as an appetizer. It will also add a great spicy flavor from your BBQ sauce.